Patagonia Women's Down Coat Jacket Sweater Hoody Hooded Goose Puffer S turquoise. Condition is Pre-owned and well taken car of. Shipped with USPS Priority Mail. Patagonia Down Sweater Size Womens Small pink puffy worn. Showing some pretty good wear on the cuffs and a small snag on the left sleeve. Condition is Pre-owned. Shipped with USPS First Class Package. Received as a gift and already had one. Brand: Patagonia Item: Jacket Size: Women’s Medium (Measurements are in pictures to help with sizing) Condition: Pre-Owned (See pictures for further details, tiny pinhole) Shipping: This item will be shipped out within 1-4 days of purchase. Check out the rest of my eBay page for similar great deals!! We would love to hear how your experience buying with us went. Be sure to leave your feedback once you secure your item! Withcontrast blue interior. two exterior zippered pockets and zipper up front.Great year round piece. 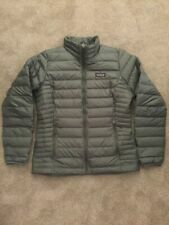 Excellent used condition black goose down Puffer Jacket. Women’s size S. Only reason I’m selling it is because I want a different color. No rips, holes or stains seen. Beautiful jacket in beautiful condition. Please ask any questions before bidding as I take no returns. ALL SALES ARE FINAL! I do combine shipping. Payment due within 2 days of end of auction. Please look at the other items I have for sale. Thank you for looking and happy shopping. Womens Patagonia Down Fill Puffer Puffy Sweater Jacket Black Extra Small XS. Condition is Pre-owned. Shipped with USPS Priority Mail. Pre owned, washed* Patagonia Down Sweater Jacket Womens S small Black insulated puffer. Condition is Pre-owned. Shipped with USPS Priority Mail. Great pre-owned condition. 16.5 armpit to armpit. With the 800-fill power of Traceable Down, you'll stay warm and toasty. The feathers create small pockets that keep the warm air in, ensuring your comfort. With a vest style, your torso will benefit from the warmth and your exposed arms will help keep you from becoming too hot. Patagonia Womens Large Goose Down Hooded Sweater Jacket in Red Jacket is in good used condition. It has some discoloration around the sleeves (photographed), but is fully functional, very warm, and a high quality product you’d expect from Patagonia. Please see the photos for a detailed view. I accept PayPal & ship promptly. The perfect warmth for just about everything, our classic Down Sweater is lightweight and windproof with a 100% polyester shell and 800-fill-power goose down. Durable shell water-resistant fabric. Shell: 100% polyester. NWT Patagonia Women’s Down Sweater Jacket 84683 | FA18 Classic Navy | Size Small. Condition is New with tags. Shipped with USPS Parcel Select Ground. With a single-pull adjustable hood and an updated, slightly longer and contoured fit. The item shown in the images is the item you will receive. Single-pull adjustable hood; center-front Vislon® zipper has wicking interior storm flap and zipper garage at chin for next-to-skin comfort. This jacket is in excellent pre-owned condition with no stains or holes. Center-front Vislon® zipper has wicking interior storm flap and zipper garage at chin for next-to-skin comfort. Patagonia Women's Down Sweater Jacket Underwater Blue Size Small. Shipped with USPS Priority Mail. 2 exterior zippered pockets; interior chest pocket doubles as a zippered stuff sack with a carabiner clip-in loop. Grand Canyon patch is embroidered on the right upper chest. the Down Sweater. Front zipper has wicking interior storm flap and zipper garage at the chin for next-to-skin comfort. This vest has been in storage uncompressed since I lost weight a few years ago. In process of downsizing for moving. armpit to pit - 21". Fabric content: 100% polyester (shell & lining); minimum 90% goose down insulation. -This jacket is in immaculate condition! This jacket is machine-washable. -Fabric color is Black. 100% Nylon With An 800 Goose Down Fill. I ADD GREAT STUFF WEEKLY! Patagonia Womens Down Sweater Vest - Large - Blue -New With Tags - Never Worn - Beautiful color!!! Ships USPS priority mail. It's like a light sapphire blue. The jacket is clean overall. Polyester fabric & Goose down filler. Goose down filler is fluffy. CONDITION & DETAIL. Zipper is good working condition. It's in good condition. As seen in good shape. small hole near elbow and near shoulder that has been sewn shut. front top collar to bottom hem 25". This vest is in immaculate condition! This vest is machine-washable. -Fabric content: 100% polyester (shell & lining); minimum 90% goose down insulation. -Fabric color is Black. HARVEST MOON BLUE / EXTRA SMALL. With a slightly longer and contoured fit. Checkback often! Single-pull adjustable hood; center-front Vislon® zipper has wicking interior storm flap and zipper garage at chin for next-to-skin comfort. Nano puff style jacket, I believe. Teal Blue color throughout. Chest: 20". Size small. Sleeve: 26". 2 exterior zippered pockets; interior chest pocket doubles as a zippered stuff sack with a carabiner clip-in loop. the Down Sweater. Front zipper has wicking interior storm flap and zipper garage at the chin for next-to-skin comfort. 800 Fill Power Goose Down. • Fall 2018 collection. • 800-fill-power Advanced Global Traceable Down (goose down certified by NSF International, traced from parent farm to apparel factory to help ensure that the birds are not force-fed or live-plucked). Patagonia Women’s Size XS 800 Fill Goose Down Sweater Puff Jacket Violet Purple. Condition is Pre-owned. No rips or stains still in great condition! General signs of wear, small holes, needs light cleaning. Sturdy, zippers functional. The color is light sliver-grey (Fog), with purple trim on the zipper and pockets. There are no flaws however due to the light grey color of the outer shell, you can see a few of the down feathers. Comfortable nylon-bound elastic armholes seal in warmth. • Item: Patagonia Down Sweater Jacket (Spring 2019) • Color: Black • Size: M (Women’s) • Chest: 42” • Length: 26” • Material: Polyester/Down • Condition: New With Tags • Thanks for Looking. Lightweight, adaptable and warm, the Patagonia Down Sweater jacket for women is great for any outdoor activity on a cool day. It is multifunctional. You can use it as a mid-layer for very cold days at the ski resort or as an outer layer for chilly summer nights around a campfire. Just like the Patagonia Nano Puff jacket, it is partly made from recycled material, which means you can be warm and do your part for the planet all at the same time. Protection - Made from 100% recycled polyester, the shell and lining both feature Patagonia's ripstop technology for long-lasting durability. Both shell and lining also boast a durable water-repellent finish, which gives good protection from light rain. The elastic cuffs, the high collar, and the hem drawstrings all keep the wind out and the heat in. Fill - The Patagonia down sweater is warmer than the Patagonia Nano Puff jacket, mainly because it is insulated with 100% traceable goose down. Down being the most effective insulator, this down sweater is a very warm jacket for its weight. Lightweight - Extremely light for its warmth (12.2 ounces or 346 grams), it is also very compact. The down sweater fits inside its own internal chest pocket for easy packing, and you can clip it to yourself or to your bag for a day's hike. The lightweight jacket will stay comfortable for any activity as it does not hinder movement in any way. Which Patagonia down sweater best suits you? Three versions of the Patagonia down sweater are available, so it all depends on what you want to do with it. Patagonia down sweater jacket - The original model has long sleeves and a full-length zipper. Shaped as a regular jacket, it does not have a hood. Patagonia down sweater hoody - Adding a comfy hood to the down sweater jacket, the Patagonia down sweater hoody goes a step further in weather protection. The insulated hood keeps the wind out for warmer ears and better heat retention. Patagonia down sweater hoody pullover - The Patagonia down sweater hoody pullover features the same attributes as the down sweater hoody but doesn't open all the way. This adds to the heat sealing ability of this model, and combined with the drawstring at the hips, the Patagonia down sweater hoody pullover will keep you warm in any weather and activity. Content provided for informational purposes only. eBay is not affiliated with or endorsed by Patagonia.